Following the last piece on the Disney-Fox deal I wanted to take a look at the spin-off company (‘SpinCo’) that Fox (NASDAQ: FOX) shareholders will be acquiring. From what we know at this early stage this will essentially consist of the Fox News Channel, Fox Business Network, Fox Broadcast Company, Fox Sports 1 & 2, Big Ten Network and, finally, around 28 local TV stations. Now, at first glance that collection of assets seems to provide some insulation from the major issue facing TV network owners: the ‘on-demand’ streaming revolution. If my household’s viewing habits are anything to go by then the main source of flux comes from scripted content consumption – basically stuff like dramas, sitcoms, and movies. There’s been a huge permanent shift toward watching that kind of stuff via online mediums such as Netflix. There are still a few big ticket shows that have withstood the trend but not all that many relative to the dozens we watch online. The content areas that seem to be somewhat immune to that trend revolve around live sports, news and topical content such as politics/business. Indeed I’d say live sports is the major reason we still have a cable TV contract. Now, as far as SpinCo is concerned it seems like it will be heavily weighted towards those three in particular. Fox Sports 1 and 2 are pretty self explanatory in that sense, while the Big Ten Network is dedicated to college sports which tends to have a pretty loyal following. The 28 local TV stations – which together reach about 35% of U.S. households – also tend to be slightly stickier in that they cover niche unscripted content like local news, weather, sports and politics. The jewel in the crown, however, is going to be the Fox News Channel. According to company projections ‘SpinCo’ will make $2.8 billion in annual EBITDA (earnings before interest, tax, depreciation and amortization) straight off the bat. That’s on the back of roughly $10 billion in annual revenue. Fox News currently brings in around $1.50 in affiliate fees per subscriber per month (this is the money that cable providers pay in order to carry the network). With around 90 million subscribers that represents around $1.6 billion in annual revenue from affiliate fees alone. Throw in the lucrative ad-dollars that accompanies 2.4 million primetime cable viewers, and you’re looking at that being the major money spinner for SpinCo. Tucker Carlson Tonight, for example, commands around $12,000 per advertising slot, while for Hannity the rate is around $8,500. Here’s where it potentially gets quite interesting for Fox shareholders. The Disney deal currently values the portion of 21st Century Fox assets that it is purchasing at around $68.5 billion. That figure includes the actual amount to be paid to Fox shareholders (in the form of new Disney shares) plus the debt incurred from Fox’s balance sheet. As it stands the market is currently valuing the whole of 21st Century Fox at $77 billion (including debt). If we take the value of SpinCo as being the difference between those two numbers, plus the $7.5 billion net debt that SpinCo will have on its balance sheet (see below), then we get a current enterprise value (EV) of around $16 billion for SpinCo. As mentioned above the new company is set to make $2.8 billion in annual EBITDA straight away. Dividing that into our total $16 billion enterprise value therefore gives us an EV/EBITDA multiple of 5.7x. There’s a few reasons why I find that interesting. 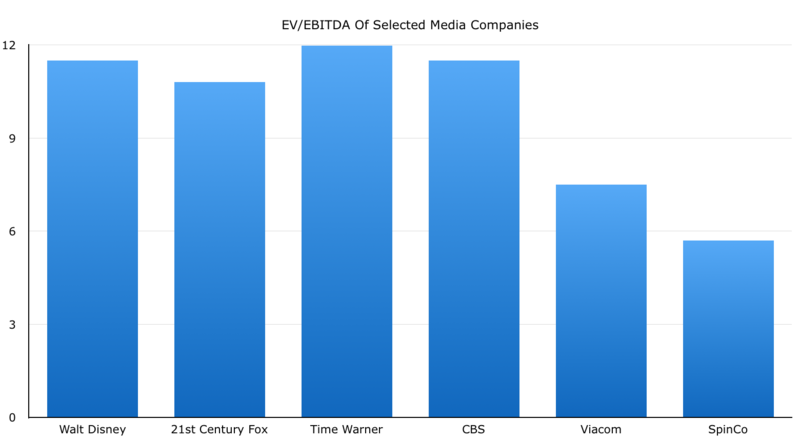 Firstly, if you compare that valuation multiple to other media companies it will stand out as being particularly cheap. Just by way of comparison Disney and 21st Century Fox are currently at something like 12x annual EBITDA. In addition, it looks as though management are planning for SpinCo to be a stodgy dividend payer judging by the post-announcement press release. With SpinCo appearing to be quite cheap, that raises the prospect of an attractive initial yield for income seekers. Following the spin-off, Fox expects to continue to pay shareholders a strong regular dividend, with the initial rate to be determined prior to the completion of the spin-off. Finally, in terms of potential growth, it looks like SpinCo will have plenty of room to maneuver post-deal. Let’s start with the balance sheet. Gross debt on day one will clock in at around $9 billion, probably dropping to around $7.5 billion net of cash and equivalents. With $2.8 billion in EBITDA that leaves the prospect of pretty rapid debt reduction even after taking into account the future dividend (which would naturally be accretive to earnings in its own right). Even if debt reduction wasn’t the number one priority you’re still looking at the ratio of net debt to EBITDA coming in at under 3x. Whichever way you slice it you’re ultimately going to be left with plenty of surplus cash each year. That might go toward increased distributions to shareholders, share buybacks, or, more likely, fresh acquisitions. Given the nature of SpinCo’s assets, many commentators are speculating that it will likely seek to acquire other assets that are built around news, sports and politics. Most likely that will take the form of additional local TV stations. If that turns out to be the case then Fox shareholders could well be looking at the perfect trinity of a cheap starting valuation, stodgy dividend, plus some decent growth prospects on the back of cashflow funded bolt-on acquisitions.